WarriorNY (Middle Village): This book would have been half as long if J.K. Rowling would have cut out hundreds of pages of Harry being whiny and Umbridge being a witch that starts with B. Harry is whiny and Umbrudge is evil....um...we get it, Rowling? Turtleback, 2004-08-01. School & Library Binding. Used:Good. 2008-08-11. Reprint. Library Binding. Good. Perfection Learning, 2004-08-01. Hardcover. Used:Good. Scholastic. Used - Very Good. Light to moderate shelf wear. Complete. Clean pages. Arthur A. Levine Books / Scholastic Press, 2003. First Edition. Hard Cover. Very Good/Very Good. Grandpre, Mary. First American edition. A couple discolored spots on boards, light crease on corner of front endpaper, jacket edges lightly rubbed. 2003 Hard Cover. xi, 870 pp. 8vo. "Grade 4 Up-Harry has just returned to Hogwarts after a lonely summer. Dumbledore is uncommunicative and most of the students seem to think Harry is either conceited or crazy for insisting that Voldemort is back and as evil as ever. Angry, scared, and unable to confide in his godfather, Sirius, the teen wizard lashes out at his friends and enemies alike. The head of the Ministry of Magic is determined to discredit Dumbledore and undermine his leadership of Hogwarts, and he appoints nasty, pink-cardigan-clad Professor Umbridge as the new Defense Against the Dark Arts teacher and High Inquisitor of the school, bringing misery upon staff and students alike. This bureaucratic nightmare, added to Harry's certain knowledge that Voldemort is becoming more powerful, creates a desperate, Kafkaesque feeling during Harry's fifth year at Hogwarts. The adults all seem evil, misguided, or simply powerless, so the students must take matters into their own hands. Harry's confusion about his godfather and father, and his apparent rejection by Dumbledore make him question his own motives and the condition of his soul. Also, Harry is now 15, and the hormones are beginning to kick in. 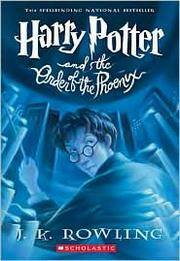 There are a lot of secret doings, a little romance, and very little Quidditch or Hagrid (more reasons for Harry's gloom), but the power of this book comes from the young magician's struggles with his emotions and identity. Particularly moving is the unveiling, after a final devastating tragedy, of Dumbledore's very strong feelings of attachment and responsibility toward Harry. Children will enjoy the magic and the Hogwarts mystique, and young adult readers will find a rich and compelling coming-of-age story as well. Scholastic Paperbacks. PAPERBACK. 0439358078 Meets the good condition guidelines. Has a minor spine crack. Has wear. Five star seller - Buy with confidence! . Good.